We came across this article via the Delhi Parsis website. Image courtesy DP. The text is from the author’s blog. by Mayank Austen Soofi for the Hindustan Times. The city’s Parsi population is struggling to survive. On the breezy evening of August 19th, 2008, around 0.0053715 per cent of the population of Delhi and its surrounding regions were invited to celebrate Navroz, the Parsi new year, at the city’s 58-year-old Parsi Dharamshala in Bahadurshah Zafar Marg. There was music, dancing, mutton pulao, salli murghi (no patrani machhi!) and cheerful cries of "Saal Mubarak." The ancestors of these happy people, fleeing persecution in Persia, had landed on India’s western shores more than a thousand years ago. However, their history in Delhi is relatively new. In 1913, there were hardly 30 Parsis here. At one point their number crossed 1,000 before dwindling to a couple of hundreds. Now there are fears that they would be silenced forever. "Our community is disappearing from the face of the earth," says Mrs Ava Khullar, a 73-year-old Parsi woman who married into a Hindu family but is still active in the community where she serves as trustee of the Delhi Parsi Anjuman. As if accentuating her foreboding, the city’s Parsi brotherhood appears cloaked in a blink-and-you-miss shroud. While driving, you won’t know when you zoom past Dar-e-Meher, the Capital’s only fire temple, next to Maulana Azad medical college. Not many know that there’s a tiny Parsi cemetery hidden behind Khan Market. Perhaps such ignorance is understandable, for it’s Mumbai that is the base of India’s Parsis. Out of around 70,000 Zoroastrians in India, 55,000 live there. In the National Capital Region, their number is embarrassingly low. 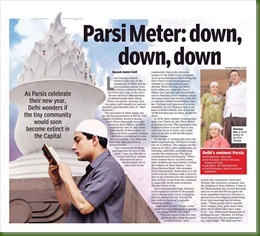 Check out the ‘Parsi Meter’ at delhiparsis.com. The population stat displayed there is so low that if you catch all Parsis in town, you would still not be able to fill the 980-seater Delite cinema. 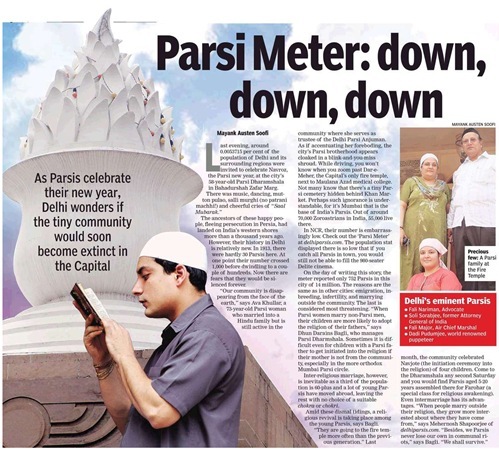 On the day of writing this story, the meter reported only 752 Parsis in this city of 14 million. The reasons are the same as in other cities: emigration, inbreeding, infertility, and marrying outside the community. The last is considered most threatening. "When Parsi women marry non-Parsi men, their children are more likely to adopt the religion of their fathers," says Mrs Dhun Darains Bagli, who manages Parsi Dharmshala. Sometimes it is difficult even for children with a Parsi father to get initiated into the religion if their mother is not from the community, especially in the more orthodox Mumbai Parsi circle. Inter-religious marriage, however, is inevitable as a third of the population is 60-plus and a lot of young Parsis have moved abroad, leaving the rest with no choice of a suitable chokra or chokri. Amid these dismal tidings, a religious revival is taking place among the young Parsis, says Mrs Bagli. "They are going to the fire temple more often than the previous generation." In July this year, the community celebrated Navjote (the initiation ceremony into the religion) of four children. There are a few more reasons to be optimistic: come to the Dharamshala any second Saturday and you would find Parsis aged 5-20 years assembled there for Farohar (a special class for religious awakening). Even intermarriage has its advantages. "When people marry outside their religion, they grow more interested about where they have come from," says Mr Mehernosh Shapoorjee of delhiparsis.com. "Besides, we Parsis never lose our own in communal roots," says Mrs Bagli. "We shall survive."